The Pacific War Online Encyclopedia: Christie, Ralph W.
Ralph Christie was a 1915 graduate of the Naval Academy and one of the first graduates of the Submarine School. He subsequently earned a master's degree in engineering from MIT and by 1938 had become the Navy's premier torpedo expert, "Mr. Torpedo." Foreseeing the shortage of torpedoes that would be experienced after war broke out, he worked diligently to increase torpedo production from the glacial 2.5 torpedoes a day from the Navy's only production facility, at Newport, Rhode Island. He had the political savvy to enlist the support Rhode Island Congressman Aime J. Forand for new manufacturing plants by promising that Newport would also be expanded. Unfortunately, his efforts were not enough to prevent a torpedo crisis, but may have prevented it from being much worse. Christie was deeply involved in the development of the Mark 6 magnetic induction exploder, which was supposed to detonate a torpedo beneath the keel of its target and break the ship's back. He was also involved in developing the Mark 14 torpedo that would use the magnetic detonators. The magnetic detonator became his pet cause, and he seems to have taken criticism of the detonator personally. In fairness, Christie was not responsible for the inadequate testing of the Mark 6. He was permitted to fire just two torpedoes with the early version of the detonator, in 1926. One of the detonators worked as designed, but the other failed to detonate. This ought to have raised a red flag, but the Navy was incredibly stingy about further testing. No live firing of the final version of the detonator took place before it was used combat. Christie also experimented with torpedoes fueled with hydrogen peroxide ("Navol") that would have been able to propel a 500-pound warhead at 50 knots to a range of 15,000 yards, rivalling the Japanese Long Lance. The Navy rejected the design because of the danger of storing the dangerously unstable concentrated hydrogen peroxide on warships. Christie was in command of the majority of S-class submarines in the Atlantic when war broke out. He led six of his boats (S-42 to S-47) to Brisbane along with submarine tender Griffin. He arrived as preparations were being made for the Battle of the Coral Sea, and got four of his boats out on patrol before the battle started. These had limited success. Christie refused to believe that his torpedoes were defective. His inspections turned up enough evidence of poor torpedo maintenance to fuel his belief that this was the root of the problem. He ordered that there be no criticisms of the weapon and threatened court-martial of skippers who deactivated the magnetic exploder. Because he was under MacArthur, he was able to ignored Nimitz' order to deactivate the magnetic exploders until the end of 1943, when Kinkaid became overall commander of MacArthur's naval forces and ordered the magnetic exploders deactivated. His insistance that the torpedoes were not at fault was one of the factors that spoiled his old friendship with Charles Lockwood. Tall and handsome, Christie had some political skill, but seemed to find himself over his head in the confused Navy politics in the Southwest Pacific. He clashed with Kinkaid's predecessor, "Chip" Carpender, as well as with Kinkaid and Lockwood. He was reassigned to Newport in August 1942, during the height of the torpedo production fiasco, to try to set things straight. He had barely arrived when he was recalled to Australia to take command of the Fremantle force from Lockwood, who had been promoted to command of Pacific Fleet submarines following the death of English. However, he received his promotion to rear admiral during this shuffle of assignments. 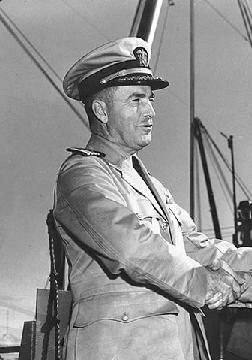 He was relieved by Kinkaid without explanation in November 1944 and was reassigned to command of the Navy yard at Bremerton. After the war, he sought command of the Atlantic submarine force but lost out to old rival James Fife, and ended his career in command of U.S. naval forces in the Philippines. Christie may have gotten off to a bad start with Kinkaid by his habit of awarding decorations at dockside to commanders returning from successful patrols. Part of the problem was that confirmation of the sinkings was obtained by ULTRA intelligence and the awards constituted a security breach. Another part of the problem was that Christie appeared to be imitating MacArthur's style, and even supported MacArthur's inclination to award Army medals to Navy skippers. The relationship with Kinkaid was probably further soured by the loss of Robalo with Kinkaid's nephew, Manning Kimmel, among the fatalities. Christie's employment of his boats has been criticized as unimaginative. Early in the war, when targeting priorities emphasized attacks on warships, he tended to station his submarines close to major bases where they were hindered by heavy antisubmarine defenses. On the other hand, he was critical of Fife's habit of maneuvering his boats like "playing checkers" and called for an investigation of Fife's heavy losses. Christie went to sea with two of his boats, Bowfin and Harder, without asking permission of his superiors. This made him the most senior Navy officer to go on submarine war patrol in the Pacific.